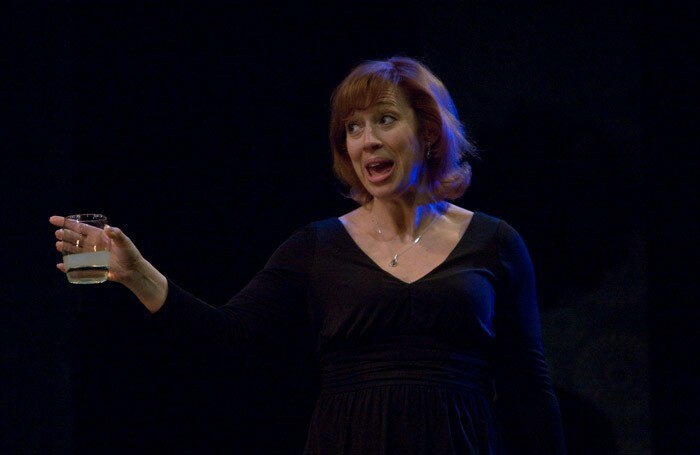 Katy Cavanagh in Iris at Live Theatre, Newcastle-upon-Tyne. Playwright Alison Carr has a knack for exploring the contours of grief. In The Soaking of Vera Shrimp, she navigated this subject matter via the story of a 14-year-old girl who learned to ‘absorb’ tragedy. In her fierce but often comic new play Iris, she stitches together the various ways in which grief can lurk under the surface for years before erupting with violent intensity. Julie (Katy Cavanagh) travels home to attend the funeral of her mother, Iris, staying in the family home where her agoraphobic sister Ruby (Sam Neale) idles away the days in a soiled dressing-gown. Patrick Connellan’s set is evocatove and familiar: an untouched 1970s lounge serving as a time-capsule with its peeling decor, wonky mirrors and brown sideboards. Julie has a one night stand with Gerry (Joe Caffrey), who comes to realise that Iris’ death is very much a live issue for the two women. Max Roberts’ uncluttered direction makes room for a formidable central performance by Cavanagh as she does battle with the lingering presence of Iris, which hangs like a shadow over the two sisters. Carr’s play is as much about new beginnings as it is about legacy, though these ideas are quite blatantly signposted at times and occasionally the play falls into 1990s sitcom territory. At its best it’s a bruising yet touching play on the struggle and ecstasy of motherhood, and the different ways in which people confront loss.